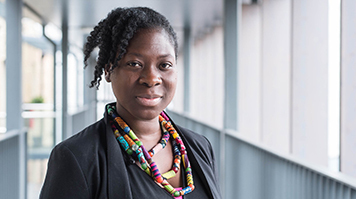 Abigail Morakinyo (BSc Adult Nursing, 2005) worked as a nurse in the private sector and NHS before starting up her own company, Health in Check, providing health and wellness services for employers. “I started out working in private healthcare, and that gives you a different perspective. People demand good service and they want value for money. I think having that grounding in customer service and that commercial awareness stood me in good stead for going out and setting up on my own. “Through my business, Health in Check, I want to teach people how to take control of their own health. Of course, there are always going to be health issues that aren’t preventable. But improving your health – by eating well, cutting out smoking, exercising and making sure you’re getting enough sleep – can have a huge positive impact not just on the individual but on their family and beyond. As a health professional, I feel I have a responsibility to put my knowledge and skills to use and make a positive contribution to the wider community. “I started my own business because I realised I needed to practice what I was preaching. I love nursing, but I was struggling to cope with 12-hour shifts in a clinical environment at the same time as caring for a baby. I was telling people to look after their own wellbeing while compromising my own. My employer was sympathetic, but they had to put the needs of the business first. That was when I realised that if the job I wanted wasn’t out there, I’d have to create it for myself. “Nurse entrepreneurs are still relatively rare. There are a lot of us working freelance, but not so many getting their own business ideas off the ground. I was really inspired by some colleagues from my course at LSBU who’d set up their own smoking cessation clinic. I thought, if they can do it, I can do it as well. It’s really inspiring to be able to look at someone who’s gone before you, and see how they’ve overcome the barriers you’re facing. Setting up on my own was like stepping from a pond into the open ocean. It was really scary! But with good support anything is possible. The RCN booklet, Nurse Entrepreneurs: Turning Initiative into Independence is my go-to guide for the professional stuff. Then for the family stuff I’m lucky enough to have a great network of friends and relatives. I’ve learned never to be afraid to ask for help. Networking is so important. LinkedIn has been such a useful tool for me and I’d encourage anyone starting or building a business to use it. It’s about building relationships, not just getting clients, although of course it’s good for that too. I got my first client, one of the big construction companies, by reaching out via LinkedIn. They were impressed by my website, invited me in for an interview and then asked me to run a taster day for them. Now I run sessions for them that focus on specific topics such as nutrition or managing stress, as well as providing regular health MOTs. Looking ahead, I’d like to be working alongside colleagues from different disciplines. I see myself as a part of team, working with say nutritionists and physiotherapists to offer a truly holistic take on health and wellbeing to corporate clients and construction companies among others. There’s so much potential out there. Expansion is a question of striking a balance between getting the work and having the resources to manage it. Getting the right work/life balance is a daily challenge. The big difference now is that I can choose how to organise my day. I’ve got my own office space, at the Health Foundry in south London, where I can work away from any distractions. There I can focus and really put in the effort needed to make my business a success. When I'm at home the kids get my full attention but when I'm in the office, it's time to concentrate on all things Health in Check. It’s all about maintaining that crucial balance and having the flexibility to choose how I spend my time. I believe I have a unique advantage over my competitors. Quite simply, I’m a nurse. I am the health professional, as opposed to being someone with an administrative background who’s hiring nurses. I’ve got that direct, hands-on experience and that’s the real added value I can offer to my clients. To anyone considering nursing as a career, I’d say: do it. There’s never a dull moment, and there are so many opportunities. You can stay in a clinical environment, but you can also go out into the community or the workplace. Nursing really is what you choose to make it – there are no limits.